English: Black widow finch, variable indigobird; French: Com-bassou variable; German: Purpuratlaswitwe; Spanish: Viuda Variable. 4.3-4.7 in (11-12 cm), female 0.4-0.5 oz (12-16 g), male 0.5-0.6 oz (14-17 g). Breeding male black, with whitish bill and red legs. Female and non-breeding male buff upperparts with broad black stripes on head, whitish underparts. Juvenile like female but head dark, unstriped. Grassy areas including fringes of cultivation, gardens, and roadsides. Male sings from exposed perch for long periods, including song and calls of African firefinch (Lagonosticta rubricata) interspersed with chirping notes. Displays to female in a bobbing flight. In non-breeding season birds associate in flocks, join mixed flocks of other small seed-eaters, and become nomadic. Seeds, mainly collected on the ground, including buried seeds dug out by scratching backwards with both feet. Brood parasite, polygynous, with males at display sites which females visit for mating. Lays one egg per host nest. Incubation and fledging periods apparently unrecorded. 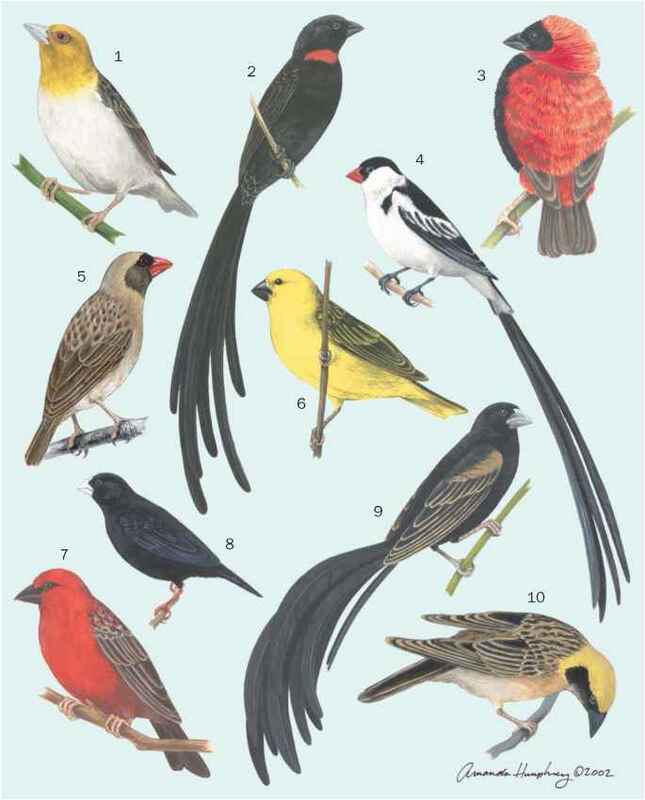 Host is African firefinch, and young of parasite specifically match mouth markings of this species; male indigobirds learn vocalizations of host while in nest, and later incorporate these elements into their own song. Not threatened. Locally common, with an extensive range in Africa.